The “Italian massacre” is one of a series of extreme violent episodes against Italian immigrants occurred at the turn of the XIX Century. The endless flow of immigration and the violence associated with labor agitation, which swept the country in the last decades of 1800, created an explosive mixture and spawned anti Italian sentiments, culminated in acts of lawless self-justice. This specific case happened after the finding of an agonizing man behind the Rouse Saloon in March 1895; the man, who died shortly after being found, was named Abner Hixon and had served as a guard during the miners strike of 1894, he was last seen hanging out with a group of Italians the night before his murder. 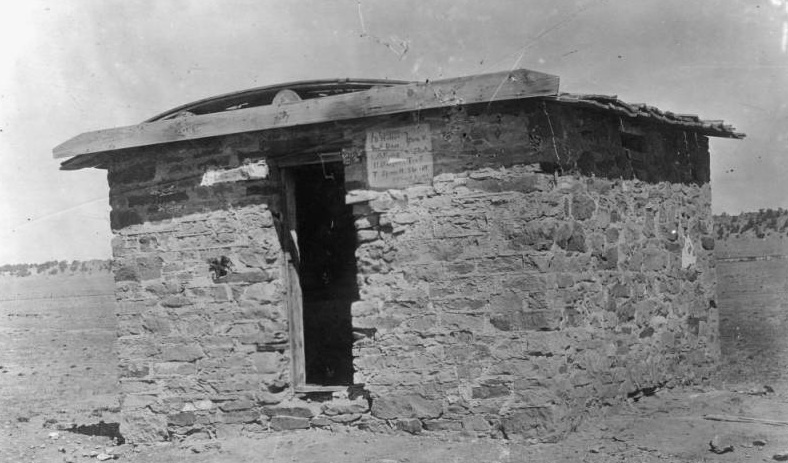 Using the highest technology available at the time, a bloodhound, the local sheriff tracked down and promptly arrested a group of italians (nine or eleven); one, Lorenzo Audino was accused immediately of being the one beating Hixon to death with a club and was sent directly to Walsenburg’s jail. Four more (Antonio Gobetto, Francesco Ronchetto, Pietro Giacobino and Stanislao Vittone) were later charged of participating to the beating and were sent into a wagon to the trip to the jail. The transport was attacked South of Walsenburg by masked gunmen, who disarmed the guard and started shooting killing Vittone and the teenager driver, Joseph Wellsby. In the confusion Gobetto and Giacobino managed to escape and Ronchetto survived hiding inside the wagon. was organized. The same night at 1 AM more masked gunmen entered the jail and executed the two italians sparing the guard and another prisoner. For the record, Gobetto was never found, while Giacobino showed up with severe frostbites and lost a foot. 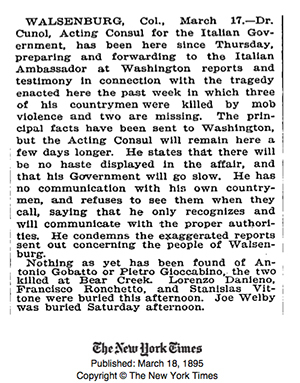 The episode, unfortunately not isolated (see the New Orleans lynching of 1881), caused the enraged reaction of the newly appointed Italian consul in Denver, but no justice was sought, the responsibles of the executions were never found and the case was discussed in February 1896 without convictions. The only “success” was a compensation of 10,000 $ (the equivalent of $ 300,000 today) for the families of the italian victims.